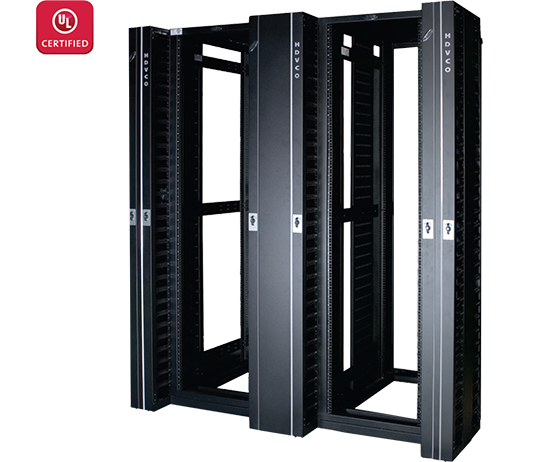 NRFS - 4 Post Series, Rigid racks designed for Combined Networking & Equipment Mounting, Server or for lab application which requires 4 post frame with low, medium or high density cable management. The Racks manufactured out of steel sheet punched, formed, welded and Powder coated with highest quality standards under stringent ISO 9001‐2008 Manufacturing & Quality management system to ensure highest quality product. Standard for Racks configuration will be welded rigid frame with 4 no Pillars of 14 Gauge steel sheet 5 folded profile welded to top and bottom cover additionally supported depth wise by welding 6 No. depth rail 4 folded 75mm 16 Gauge profile with optional side panels. Recommended to grout on floor with plinth.